The curved drop handlebars long found on racing bicycles are pretty nifty, right? If you want to get down low to reduce your wind resistance you grab hold of the lower part, and if you’re climbing a hill and need to get a bit more weight and leverage on the crank you can shift your grip to the top bar. The Continuously Ergonomic Race Vehicle (CERV) concept bike takes things a step (or two) further with a design that dynamically adjusts the position of the handlebars based on the terrain being covered, all without changing the seat-to-crank height. Developed into a working prototype by Ohio-based Priority Designs, the CERV is based on a concept from Cannondale that called for a design that allowed the handlebars to move up and down without altering the distance from the seat to the crank. The answer was a triangular frame with 100 mm (3.9 in) of travel up and down that moves in relation to the front end’s 85 mm (3.3 in) of travel forward and back. When descending a hill, the CERV’s front end moves forward and down to give the rider a low profile, while climbing a hill it moves up and back for a more upright rider position – on flat ground, the handlebar position is somewhere in between. The movement of the front end meant that a traditional fork wouldn’t be possible, so the Priority Designs team opted for a single-sided swing arm, which removed the traditional front fork altogether. However, you’ve probably noticed that the front fork is also handy for translating the steering movements of the handlebars to the front wheel on most bikes. With perfectly straight bike routes a rarity, Priority Designs built a mechanism that translates the steering movements from the handlebars to the front wheel through the bike’s frame. Similarly, the chainless bike translates the movement of the crank to the rear wheel via a transmission running through the shaft of the rear support arm. 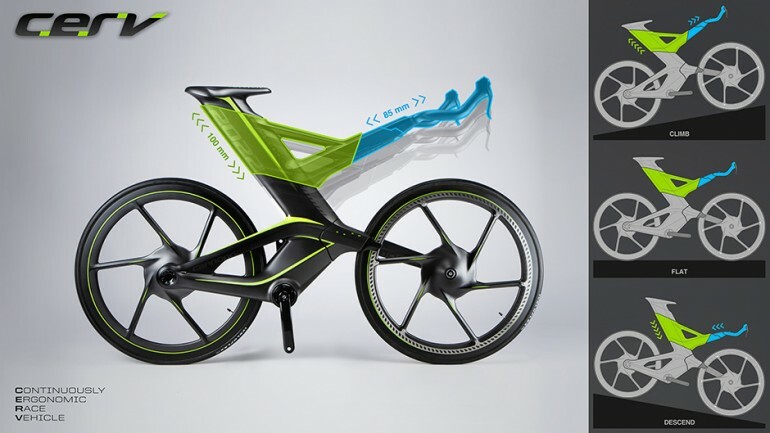 The CERV concept bike was unveiled at the Eurobike exhibition in Germany at the end of last month. The chances of it appearing on a road near you anytime soon seem remote.